This lesson can be used as a pre-lesson for the What We Like About StoriesLesson plan. Summary: A short statement about something. Students will be able to identify the parts of a fiction text. 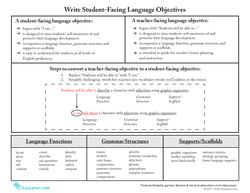 Students will be able to identify elements of a fiction text with grade-level words using visual and written supports. Display the cover of an engaging new read aloud text. 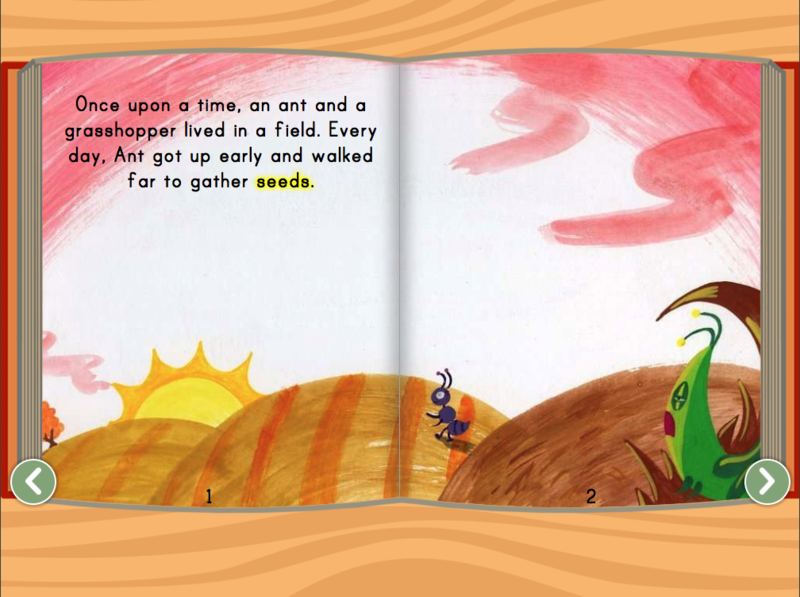 Ask students to look carefully at the cover and share what they see using the sentence starter, "I see__." Tell students that the cover of a book helps us to learn about the story. 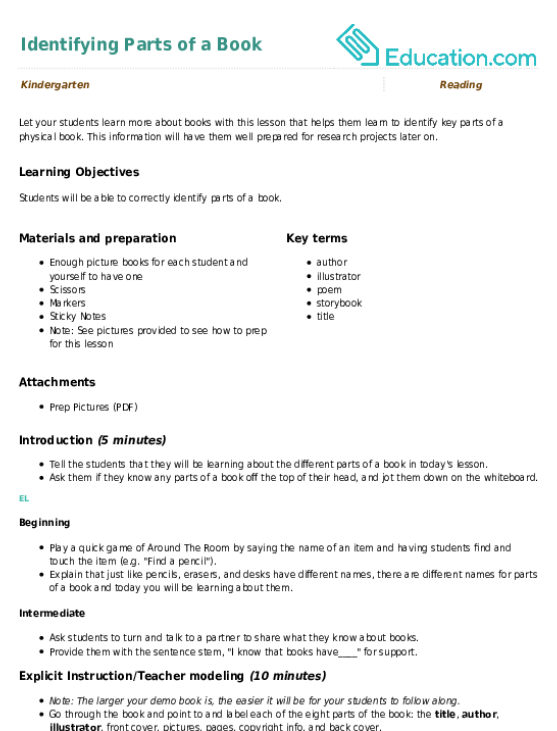 Read the title aloud and connect the title to the cover by identifying how they go together. Introduce the lesson focus by saying, "Today we will be learning about the different parts of a book and what makes them important to us as the reader." 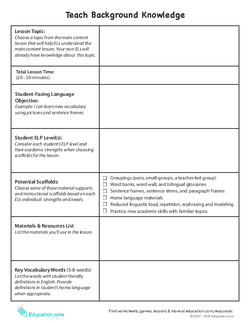 Display the Vocabulary Cards and provide student-friendly definitions for each new word. 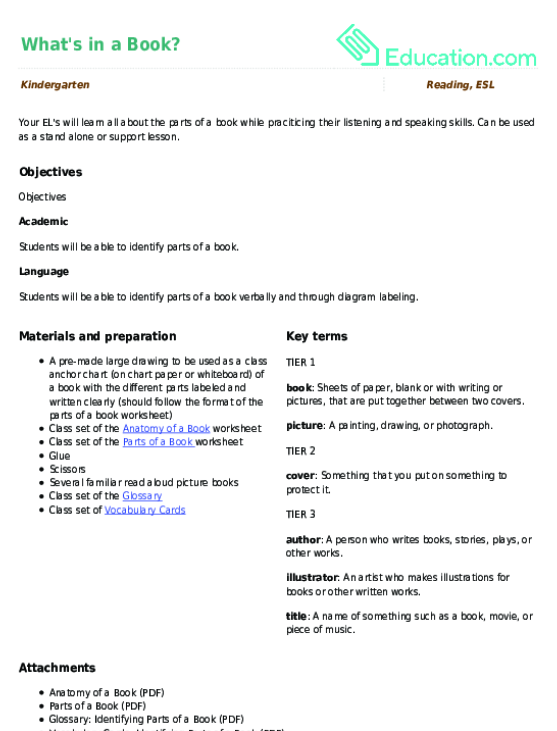 Discuss the function of each part of the book and how it helps the reader. Point to the different parts of your demo book and have students practise identifying each part of the book using the new vocabulary words. Pair students together and pass out a few different books and a set of Vocabulary Cards to each pair. Demonstrate how to play a game called, "Find the ____." using the Vocabulary Cards. They should hold up one of the cards and see if their partner can identify the matching part of the book. Have students play together, taking turns choosing the Vocabulary Cards. 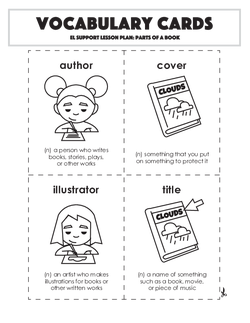 Pass out the Parts of a Fiction Text worksheet to each student to complete independently. 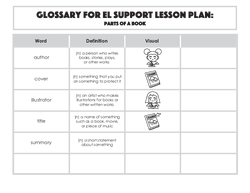 Have students complete the Book Words worksheet for additional support. 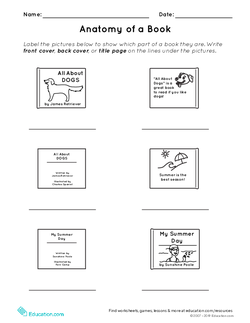 Work with a small group of students to identify each part of a book using the visual vocabulary cards for support. 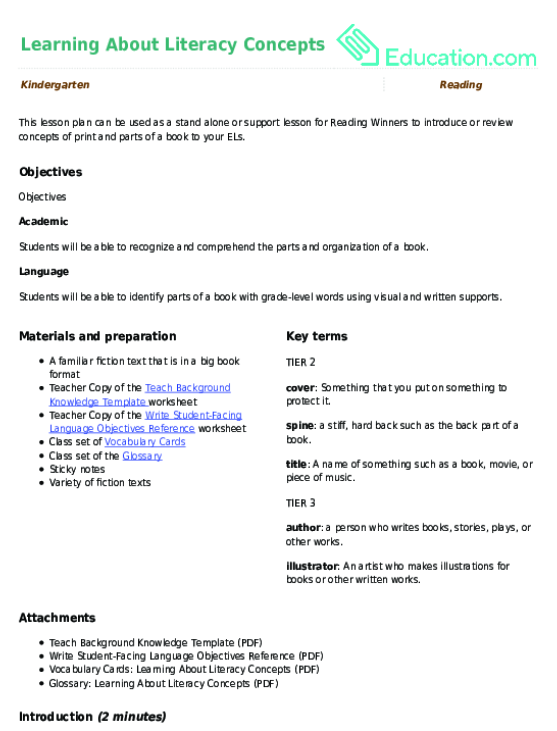 Encourage students to identify the parts of a fiction text using additional books from the classroom library. 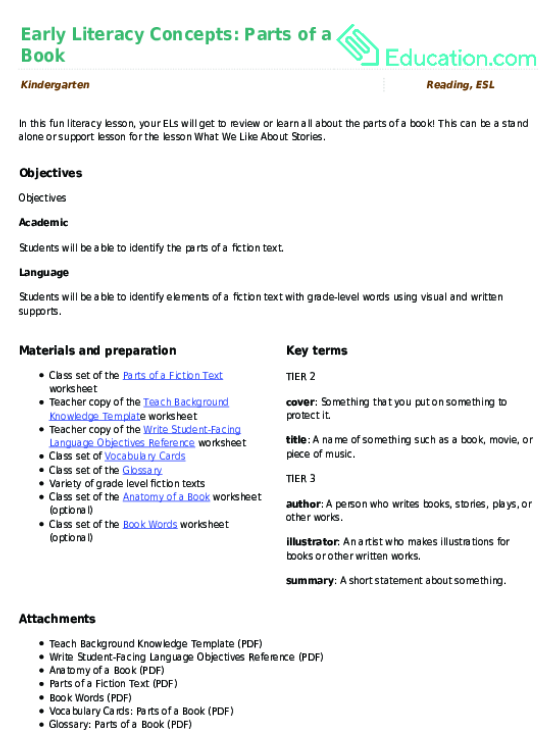 Pass out the Anatomy of a Book worksheet for students to complete. As students are working in pairs, walk around and informally assess if students can differentiate between parts of a book. 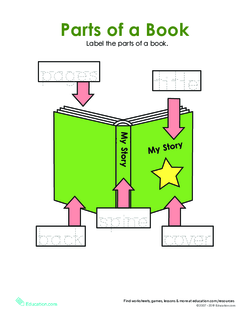 During independent work time, ask students to share the function of each part of the book. 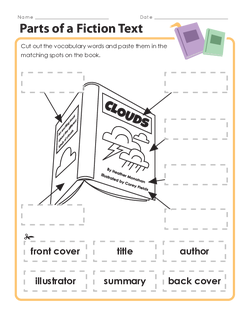 Collect student work to formerly assess if students are able to match the vocabulary words to the correct part of the book. Review why the different parts of a book are important (e.g., cover makes us want to read, teaches us about book).